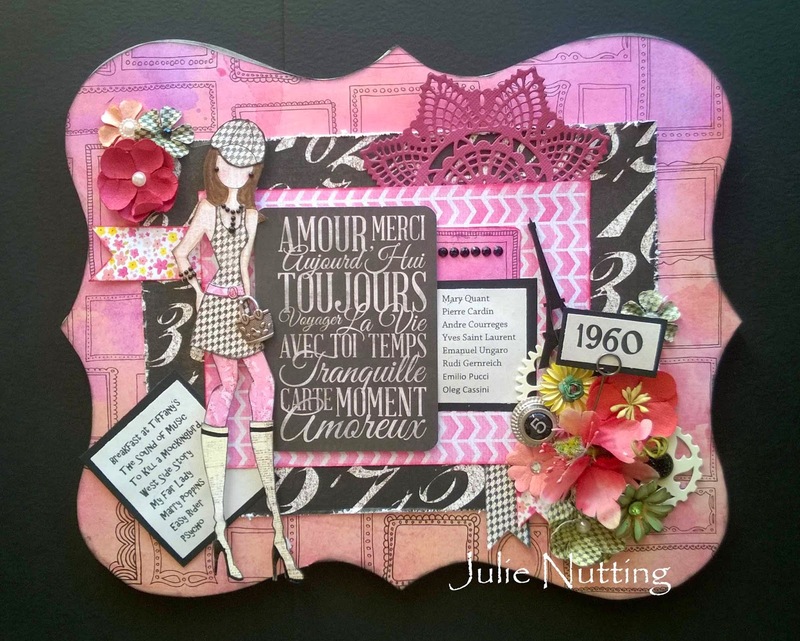 Julie Nutting Designs: Here's the Rest! 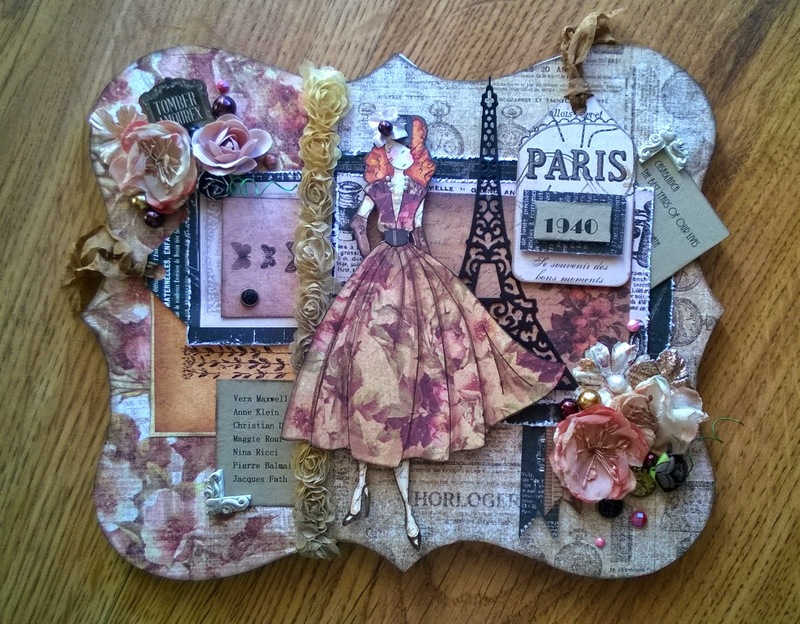 Here a few samples from CHA, the craft industry's largest trade show that was held in January. These are the rest of the stamps that I designed in my Through the Decades collection. On my last post I talked about how I make up stories when I draw. I've drawn this way for as long as I can remember. My illustrations always had a story to accompany them. Meet Rita. The late 40's was a milestone for fashion....Christian Dior became huge with his New Look., cinched in waistbands with full luxurious skirts. This particular dress is an actual Dior dress from that period. Now mind you, Rita could not afford to dress like this, so she made her own version. I'm thinking after the war she came to Hollywood to become a star. Hmmmm, I wonder if she made it? Of course with the 3/4 length tight sweater and black and white, I was thinking the Audrey but as I got more into it, I decided she was more of a rich socialite. Perhaps she married rich and loved to shop and host great parties. Of course belonged to the best country club! With those sunglasses, I'm thinking she probably drove a fancy little convertible! The 1960's brought one of the most drastic changes to fashion ever. London was the capitol of mod fashion and this is where Jill lived. She of course was a model and hung out with rock stars. She may have even dated a few! Is the plaque or canvas Prima? Nice to display as framed art. Beautiful! Wow Julie! 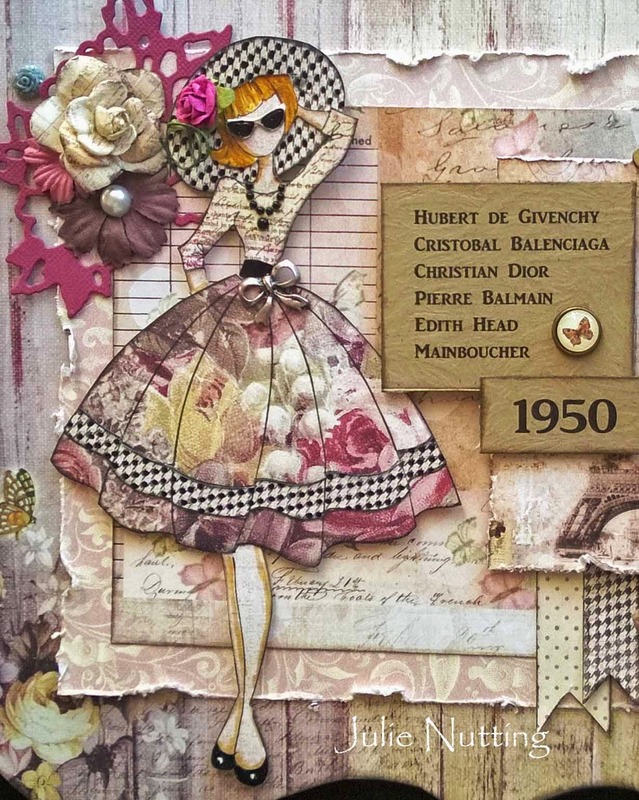 These are all really stunning and such beautiful creations too, especially Audrey who I think is my favourite as I love 50s style frocks. i love the paris one! actually i love them all. lol. Love these too! Audrey is just my type! No.. maybe it's Rita with her Dior dress! Although I was born in the 60's so maybe Jill may be a fav… Nope! I can't pick which one I like best! I hope to see you again at the Scrap n Yap soon! Love all your girls. Can you make some stamps or a designer book with clothes for them and us to cut out. Love the new girls ... said I wasn't going to buy anymore... Hahaha ... that worked for a couple of weeks ... I just bought two !! that's funny, Rea' Thank you! I have only used dots and they worked fine. Haven't attempted magnets.